The Guardians have been taken prisoner by the Spartoi Empire for daring to protect Earth from the Badoon. Technically, the Badoon weren’t supposed to be on Earth, either, but they all got killed by the Guardians, so they couldn’t get arrested (the Guardians are not strong on the “superheroes don’t kill” ethos). Luckily, everyone ignored Groot because he got blown up way back in the first issue (remember? ), but now his regenerative abilities go into overdrive when his friends need him. Normally, a character who literally says nothing but a catchphrase would be annoying, but McNiven makes up for being unable to draw a cool anthro raccoon by making a very emotive tree man. This is basically the end of the series' first arc. Brian Michael Bendis has not revealed much at this point, other than the fact that there is more to be revealed. That seems to be his modus operandi; hints dropped early in his New Avengers run didn’t pay off for years. 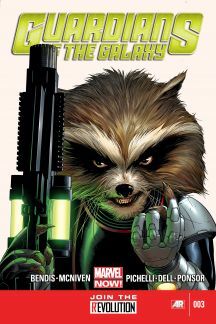 It’ll be frustrating for a while, but hopefully, that’s the case here; at least we know Rocket Raccoon and Groot won’t be going anywhere anytime soon. Heck, maybe they’ll be around long enough that someone who can actually draw a raccoon will come on board. 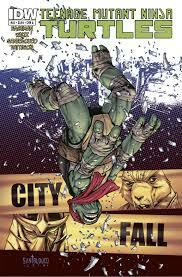 The big Teenage Mutant Ninja Turtles comic event, “Cityfall,” is here. It’s not exactly a crossover event, because it’s just the one book. I guess it crosses over into some Villain Micro-Series issues later on, but that’s beside the point. This is the story of the Foot Clan’s leader, some guy who calls himself the Shredder (he’s kind of a big deal in this universe), deciding that he needs to lead the biggest underworld ninja mafia in New York City (remember those?). His current henchmen, Karai and Alopex, aren’t cutting it for him, so he sets a plan in motion to recruit Leonardo. Part one of the plan involves kidnapping, not Leonardo, but Casey Jones and Raphael, as bait to trap Leonardo. Raphael escapes, but that ends up working to Shredder’s advantage, as now Raphael can alert his brothers to the trouble Casey is in. The issue ends with Casey in dire need of hospitalization, while the Shredder’s plan to capture Leonardo has worked, as well. The art is by Mateus Santolouco, who did a wonderful job on the The Secret History of the Foot Clan mini-series. His work here isn’t quite up to that standard; it’s still some of the best seen in the main series, but it’s also apparent that he had more time to work on the mini-series. Hey, another one of those coincidences; another book with a new arc starting up! This time, it’s the “Hellfire Saga,” featuring the school for mutant supervillains started up by the new Black King of the Hellfire Club, Kade Kilgore. 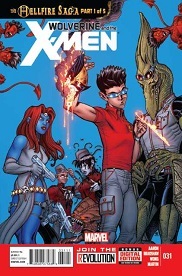 The story follows former Xavier and Jean Grey School malcontent Quentin Quire on his first day of classes. However, Quentin isn’t here because he still has dreams of supervillainy; he’s here to try and rescue fellow runaway Idie Okonkwo, who is out to avenge yet another fellow runaway Broo’s non-fatal shooting. The new school parodies the original issues of Wolverine and the X-Men, with a staff, student and class list in the final pages (including “Subjugation Through Science: Experiments So Simple Even An Absolute Moron Like You Can Do Them, with Dr. Karl Lykos” a.k.a. the one-tailed pterodactyl, Sauron). The tone is darkly humorous throughout (Quire taunts teacher Mystique: “Funny you should say that. Didn’t Wolverine actually kill you not too long ago?”); an evil version of the old mutant school is an obvious set-up, but has never been done before to my knowledge. The cartoonish art is in keeping with the book’s humorous tone; however, since it is so dark, it can be jarring (this isn’t the “Happyfire Saga” arc, after all). Also, are those thought bubbles? Now there’s a blast from the past.